Are you already picturing your new kitchen in your mind but there’s a blank wall behind the stovetop, the benchtop or the sink that you can’t seem to put your finger on? 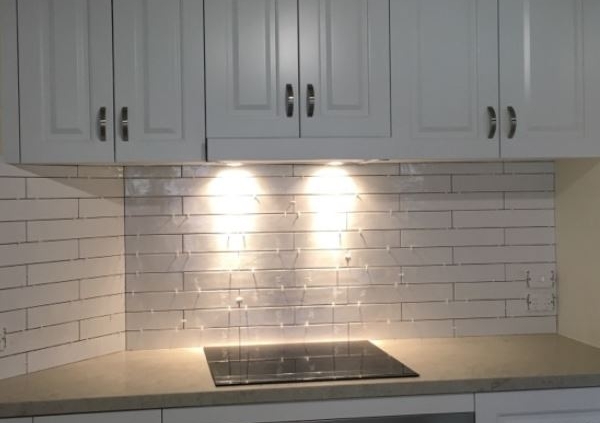 This 2019, tile splashbacks are making a comeback. And it’s all about feature walls. Your kitchen is the social hub of your home and choosing the right splashback will complement the design of your kitchen. If you’re thinking about adding depth, texture, colour and style to those empty walls then consider tile splashbacks. Tile splashback feature walls are all about carrying the tile from the benchtop to the ceiling. In some designs, it can be seen behind floating shelves and rangehoods. Splashbacks is at or just below eye level and it will naturally attract attention. In 2019, this trend is seen to be expanding to the outdoors and in alfresco dining areas. This way, the light will showcase the tiles’ natural beauty. When choosing tiles, consider that they can be cost-effective, easy to install and also easy to clean. If in doubt – wait! 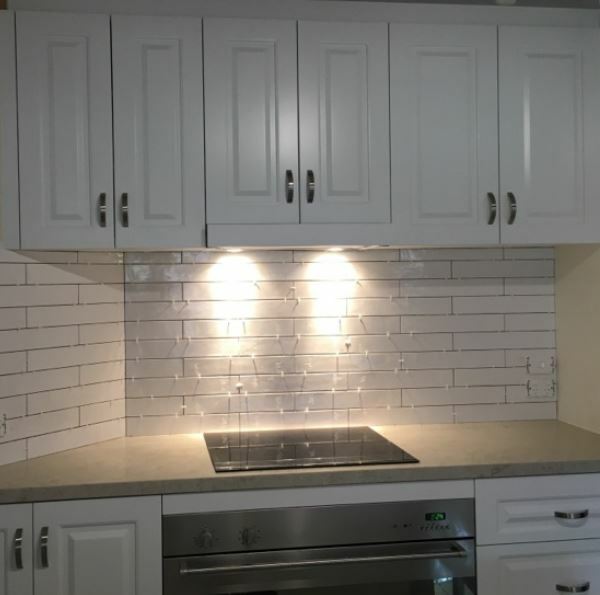 If you are unsure about which splashback is better, our Craftbuilt kitchen designers are professionals when it comes to kitchen renovations. With over 40 years of experience, our designers can offer you a wide array of tiles to choose from. Equipped with the latest designs and modern offerings, your tile splashback feature wall will certainly attract attention. Consult with our Craftbuilt specialists today. Visit our New Modern Kitchen Showroom at Stones Corner today and avail of amazing kitchen appliance discounts! Splashback materials and designs are often one of the last things clients think of when renovating their kitchens. acts as a decorative feature in your kitchen design. Where are kitchen splashbacks placed? Splashbacks are often placed on the wall above the sink, cooktops or benchtops. They are commonly found in areas where food preparation or cooking occur. What are the different type of splashbacks? There are various traditional and modern splashbacks you can choose from. It all depends on your personal preference and over-all kitchen design. Glass – Glass splashbacks are an elegant option. They are quick and easy to install. They are quite popular because of the light and clean feel they provide. They are to clean and do not require grout as they are custom made to fit in large sheets. You can also custom design your glass with real art. It offers a unique and relevant conversation piece. Tile Splashbacks – With many tiles to choose from, you can be experimental with the design of your splashback. You can mix and blend different tiles for a more decorative approach. They are easy to clean as long as the material and the grout is cared for properly. Acrylic – Acrylic splashbacks are available in a whole range of different colours and are generally much cheaper versus other materials. However, acrylics aren’t advisable behind kitchen areas with direct heat or contact with cooktops. Stainless steel – Often used in commercial kitchens. Depending on its aesthetic appearance, stainless steel can also offer family kitchens a modern twist. Mosaic – Taking inspiration from this style, clients can choose from different designs. With so many materials and textures to choose from tiles, glass, stone, metal, wood and many more. The resulting design can be amazing. Timber – Using timber panels with the different textures and grains can complement your light, medium or dark cabinetry. Marble or Stone – Whether you want to continue your benchtop’s material to the walls, or create a contrast with the different textures, veins and grains available, marble or stone can make great splashbacks. 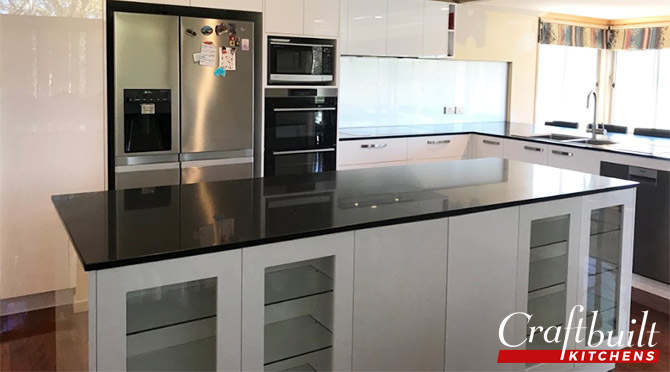 If you’re looking for a specific splashback material or design, and attune to your over-all kitchen renovation theme, our kitchen designers are happy to sit down with you and discuss alternatives, styles, budget and material. 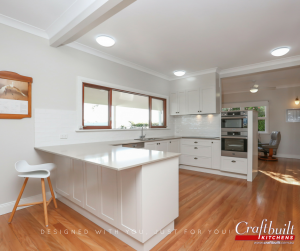 Call Craftbuilt Kitchens at (07) 3341 9166 and set a 3D appointment with our kitchen designers so you can see for yourself what your dream kitchen looks like virtually. The kitchen is considered to be the focal point of the home. Upon entry, guests would see the kitchen bench top as one of the first things anyone would notice. This kind of attention means your bench top can either really lift and compliment the look of your kitchen or bring it down. Which is why it’s important to get it right. It is important to highlight that the kitchen countertop can pull in the whole theme of the kitchen as well. This is something to consider when planning your kitchen renovation. When it comes to kitchen counters, there are various materials to choose from when it comes to bench tops. There are counter-tops such as Caesarstone, stainless steel, granite and marble. However, for real affordability that looks good, laminate is sure to be the winner. Laminate may inspire thoughts of gaudy yellows and bright greens from the 70’s style kitchens. But not these days! Today, laminate benchtops comes in a range of stylish colours to suit any taste. Laminate is cost effective. It won’t burn through your budget unlike granite and other stone materials can. If you’re looking to install a benchtop in your kitchen that is affordable, then laminate is just the thing for you. Plus, it’s easy to install because it weighs considerably less compared to other materials used for kitchen benchtops. But if your mind is set on getting granite or timber, don’t be disheartened. Due to the vast range of colours and styles available in laminate, you can have the look of a stone or timber bench for your very own kitchen. Laminates are made from top of the line computer technology. Computer tech is used to create a fine laminate material that is adhered to MDF or particleboard with the help of waterproof and heat resistant glue. They are then bonded together by way of high pressure. High-pressure laminate will also provide ease of cleaning and protect your investment. This means your benchtop is resistant to stains and scratches. On the topic of cleaning and preserving your bench top, the option of no joins will create an easier job of cleaning as it will be seamless and will not collect food debris. 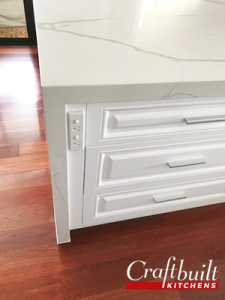 If you choose post formed laminate, this will eliminate joins between the sides and top of your bench top reducing the risk of peeling laminate. There are obvious care tips in taking care of a laminate. Just always remember to never place hot pans directly onto the bench and when cutting food, you should always use a cutting board to protect your bench top – no matter what material your counter is made from. 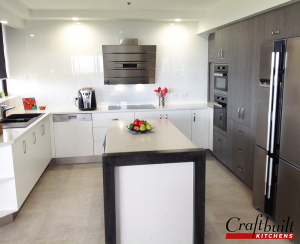 When you have made the choice to use laminate, you can come visit our kitchen design consultants over at our Craftbuilt Kitchens showroom in Underwood, Brisbane. They will guide you in making your kitchen, and ultimately your home, look spectacular and you will be impressed at just how modern and attractive a laminate bench top can be. To know more, contact us today at (07) 3341 9166. Water, oil spatters and food debris can quickly damage your kitchen without the proper protection and covering. When you are looking over kitchen magazines and deciding the colour scheme and style you like, remember not to overlook choosing the best splashback. Not only do they complement stunning kitchens perfectly, but they also serve the purpose of protecting walls from splatter and damage. This is why splashbacks are a very important part of the kitchen. It adds to the over-all aesthetics of your kitchen and it also protects the walls in your food preparation area. There are a few different options available and it can be daunting to decide which one is best for you. No doubt about it, the splashbacks you choose can really boost the aesthetic appeal but you also want one that will last a lifetime and is also easy to clean. It’s nice to want the very best materials for your kitchen splashbacks but you still need to consider your budget when choosing. The good news is that there are some great affordable options. Part of your budget will need to include the maintenance that is required for your splashback. While some materials are easily cleaned with the use of a wet cloth and a bit of detergent, there are others that call for particular cleaning products to protect the splashback from damage and streaks. When it comes to cleaning and maintenance, remember that splashbacks that need more care will also take more time to clean. 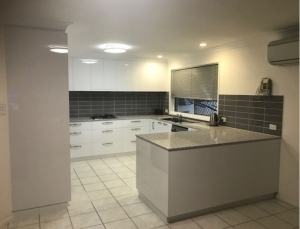 Let’s take a quick overview at some of your options for spashbacks for kitchens in Brisbane. The most common materials used are tiles. There are many fantastic colour, shape and style options available in tiling however keep in mind grout can become very dirty and will require some work to ensure a hygienic and clean surface. This is the same with mosaic tiles – a very attractive feature in your kitchen. Be prepared to put in a bit of elbow grease if grime builds up when it comes to tiles. Glass splashbacks can be an expensive option, but the upside is that they are very hygienic and easy to clean. For a more modern look in your kitchen, stainless steel is quite popular. Stainless steel is quite often used in professional kitchens and is known to be very hygienic. However, marks and smudges can show up easily on stainless steel and will require appropriate cleaning. If you decide to go with the more budget friendly option of paint, be sure it is water resistant. Timber looks beautiful in a kitchen. When installing, great care must be undertaken to make sure it is sealed properly. Choosing splashbacks for kitchen design in Brisbane can be a very exciting part of the process. By investigating your options and deciding what is best for you, you will have a beautiful kitchen with wonderful splashbacks that serve their purpose. Our designers here at Craftbuilt Kitchens are available to listen to your needs and help you achieve the kitchen of your dreams. Your questions will be answered and you will be given plenty of information regarding your kitchen installation. All of our staff members are highly qualified and here to assist you in any way they can. Rather than go for the more uniform look in your kitchen why not mix up the textures with a little contrast. 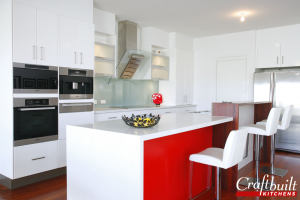 For example, timber bench tops and stainless steel splashbacks make quite a nice statement. If you like the idea of mixing it up try thinking in terms of natural mixed with artificial or rough surfaces mixed with smooth. If the idea you have in mind for your kitchen is all white, or perhaps neutral colours, why not add a zap of colour to brighten it up. Bright red splashbacks are very striking in white kitchens whilst aqua and yellow also looks amazing. Chrome is another great way to throw a little colour into a neutral colour mix. By using chrome you will enjoy a feeling of luxury and style in your kitchen. Always popular, tiles are durable and add a classic feel to the kitchen. Though you can make it a little more modern with modern colours and patterns. This style of splashback is taking over the popularity of tiles. It comes in a great range of colours and finishes that look sleek. The best part about glass splashbacks is that it’s easy to clean with no grout to collect grime and grease. If you’re looking for something a little more unique or ‘out there’ we can work with you on that too. There are many amazing ideas and styles our designers at Craftbuilt Kitchens can suggest to you to really help your kitchen come alive. 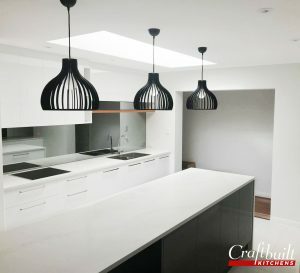 At Craftbuilt Kitchens we constantly aim to provide our clients with the most up to date products and design ideas that are currently in trend. This way, the kitchen you end up with is modern, stylish and well suited to your own tastes and needs. Splashbacks are not new but have been around for many years (and for good reason). Various materials can be used in splashbacks – aside from those mentioned above, laminates are also a good option. Bright colours or bold patterns are a great way to catch the eye. You can choose your splashbacks to be solid colours or patterns. Stainless steel is a very popular choice in modern kitchens as they give the feel of a professional chef’s kitchen. Glass splashbacks are one of the more popular choices today. Want to make it more modern? You can have painted artwork or digital print added for an artistic look. If you don’t wish the splashback to stand out and just serve as a functional part of the kitchen, this is achievable too. Plain creams, whites and other neutral shades are a great way to ‘dial’ down the splashback and have it blend in more rather than stand out. Splashbacks are impervious to liquid, oil and grease. With the absence of these items, your kitchen walls are far more hygienic. When the kitchen area is simpler to clean, you are more likely to keep the area clean and looking good. Contact our friendly team at Craftbuilt Kitchens to discuss your new kitchen and the splashbacks that will look great and serve a purpose too. You can also visit our showroom at 2958 Logan Road, Underwood. When you are planning your kitchen, there are many facets to it that serve as aesthetic and functional parts to the overall design. Kitchen splashbacks are among these items that not only look good and can add to the overall look of your kitchen, but also serve a great purpose. In case you don’t know, splashbacks are the area on the wall behind your kitchen workspace. These can range from tiles or stainless steel to glass, laminate and stone. They not only keep this area clean but they are also easy to clean and are hygienic. They protect the walls and cupboards below from food splatter and any possible water damage or grease stain. Glass is one of the most versatile materials used in modern construction. It is typically used to allow natural light into a modern skyscraper, or to invite the outdoors into modern homes and apartments through the use of large picture windows. While still in demand in these traditional areas, glass has transcended such mundane functionalities and moved indoors to create new dimensions in interior design. Glass splashbacks are very popular in today’s kitchens and have several advantages. 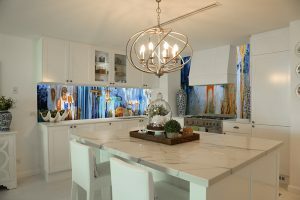 When you visit kitchen showrooms and view displays or pictures with coloured glass splashbacks, you will notice that they provide a cleaner, lighter and bigger feel to the area. But it’s not all about looks when it comes to splashbacks – and glass has the practical areas covered, too. Unlike tiles, a glass splashback is seam free and does not require the use of grout. This means no flaking or peeling. The grout in between tiles is also quite porous and so is not only perfect for bacteria to breed in, it is hard to clean. Glass splashbacks, do not have these issues. You can create any kind of atmosphere you like when you choose the colour of your glass splashback and because it is glass the light will be able to shine through and reflect back adding a wonderful lighting effect to the room. Amber colours offer a cosy and warm feel while greens and yellows can create a fresh summer feel. Even if you prefer the use of darker colours, when you use glass as a splashback you still get more light reflected than if you had chosen tiles. Such a simple design is so effective when it comes to glass splashbacks in your kitchen and they are incredibly easy to clean. Provided you follow the advised care instructions and are careful not to use abrasive cleaning products or sponges your glass splashback should remain attractive and functional for many years. 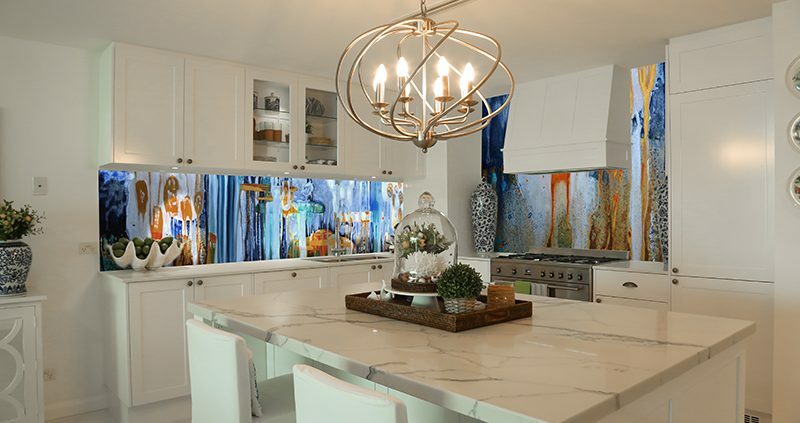 Glass splashbacks create an air of elegance that is simply not possible with other treatments, but this is not the only benefit this remarkable material can offer. The installation, for example, is quick and easy. Glass splashbacks are made in large sections with screw holes predrilled. They attach to the wall using a bonding agent so there is no fiddly measuring and placement like there is with rows of tiles, trying to keep them in alignment while they bond to the wall. There is also no need for messy grout and trying to fill the spaces between the tiles evenly. The durability of glass splashbacks makes them a desirable addition to any busy kitchen. Manufactured from toughened glass, the same type of glass used for oven doors, oven bakeware and chopping boards, its resilience is proven. As a result, the splashbacks are completely resistant to chips, scrapes, scratches, knife marks, acidic juices squeezed from citrus fruits, in fact any hazard that results from working in a family kitchen. They are also extremely resistant to heat as would be expected from a material that is used to make oven doors. Cleaning and hygiene go hand in hand, especially in a kitchen, and cleaning glass splashbacks is an absolute breeze, no matter how dirty and greasy they become. A quick spray with glass cleaner, a wipe over with a cloth and the sparkling shine is back. Glass is a smooth surface, so mould and bacteria find it very difficult to attach themselves as they do with grout. This allows the cleaning fluid to do its job and completely remove any trace of mould or germs, making the kitchen with a glass splashback a much healthier environment for the preparation of food. The final benefit of choosing glass splashbacks is simply because they look absolutely stunning. They are available in an astonishing array of colours, allowing the home owner to match the splashbacks with any part of the kitchen or any other decorator feature they choose. In some cases they can be manufactured to include LED lighting, an inventive concept that designers use to create a diffused lighting effect that looks sophisticated and ultra-modern. Coloured glass splashbacks completely transform a kitchen. They cover a large expanse of wall in bright, modern colours very quickly, and the sleek, clean lines support the current, minimalist trend. If a new kitchen is on the horizon, a visit to any of the kitchen showrooms to see a glass splashback set into a display kitchen is an absolute must. A chat with a professional kitchen designer will help you choose the perfect colours to combine with your cupboards and benchtops so that you can create the desired effect and enjoy many hours of cooking in your new kitchen for years to come. Visit our showroom today at 2958 Logan Road, Underwood, QLD 4119 or call (07) 3341 9166 to set an appointment. There are many important aspects to consider when it comes to having a kitchen put in. The kitchen flooring is one of them. The flooring anywhere in a home needs to be able to withstand a lot of wear and tear. However, in the kitchen, the flooring is expected to take more of a beating. There are many different options, you simply need to pick the right one for you. Some of us wait many years to be able to get our dream kitchen installed with all the modern storage ideas, beautiful bench top finishes, cooktops and splash backs to match the décor and the right lighting to enhance it all as well as being practical. When we finally do get our kitchen installed, we can’t wait to get in there and try it out. We are totally delighted with the way it makes the overall effect so elegant, that is, until we look down and realize the old flooring serves to detract from a perfect finish. Whatever we do, we must keep in mind that we need practical and durable floor coverings that will also enhance and match in with the kitchen and wall colour scheme as well. Kitchens are usually high traffic areas and need something that will be appropriate for this situation and still look good. Most prefer ceramic tiles for their kitchen area, as they are easy to maintain. But unfortunately, if you cannot get the non slip type, the downside is possible injury through slipping on a wet floor. For older people who often are prone to body aches this is not a good choice. With the right flooring installed, the kitchen design ties in nicely together. Keep in mind that if you spend a lot of time in the kitchen, you don’t want to be standing on a hard surface. The first thing to remember about kitchen flooring is that it isn’t just about feet and shoes. Liquid and food spills are a guaranteed occurrence in the kitchen and this is wise to keep in mind when choosing your ideal floor. Materials that are affordable, easy to maintain and resistant to rotting are of course the most sought after. Here is a run down of a few options available. Linoleum – One of your more expensive options, this flooring is made from Linseed oil, wood powder, ground limestone and pine resin. The fantastic trade-off for this being an expensive choice is that it is environmentally friendly. It’s an easily maintained flooring that is extremely durable. Linoleum wood flooring is available in a great range of colours. Linoleum, that used to be commonly used flooring, is still used today and has undergone many improvements, making it a durable and practical choice. Some styles look like parquet board and are very attractive. Vinyl tiles are another brilliant product, with colour ranges to co-ordinate with your kitchen and wall colours. They are thick and easy to install. They are also great for legs that have to be standing in kitchens for long spells at a time. They also have built in shine. It just needs a sweep and a mop to keep them looking great, and do not need to be polished. Vinyl – One of the most popular choices in kitchens flooring, vinyl is easy to maintain, inexpensive and durable. Available in a great range of textures, colours and patterns, vinyl is hard-wearing and is spill resistant, making it a fabulous option for kitchens with kids. Stone – The most sophisticated choice in kitchen flooring. Stone comes in options such as granite, slate and limestone. Stone looks fantastic in large kitchens or modern homes, it is easy to maintain and is incredibly durable. Cork – Easily installed and kind on your feet for its shock absorption, cork adds a natural look to your kitchen that is warm and inviting. Resistant to flame and termite infestations, it won’t rot even when wet for long periods making it a handy kitchen addition. Cork tiles look marvellous and are wonderfully soft underfoot, and once sealed they can be easily kept clean with a damp mop. They have a varnished look and would co-ordinate with most kitchen areas. Polished concrete – Growing in popularity, polished concrete is starting to be seen in more and more homes. Hygienic, easy to clean and incredibly durable, polished concrete can have non slip additives put in to make your kitchen floor a safer surface to walk on. Figuring out which flooring is best for you? Visiting our kitchen showroom and talking to an expert designer about the options available to you with your budget in mind will make the decision process easier. When it comes to choosing kitchen flooring the decision can’t be made lightly. An experienced professional will advise on the type of flooring that best suits your kitchen and needs. So many of us are making more conscious decisions to choose eco-friendly products. We have a greater understanding, today, about the negative impact our choices make on the planet. Eco-friendly or ‘green’ choices are happening everywhere. They are in the food products we buy, the clothing we wear, our personal items, fuel, electricity and more, but it doesn’t stop there. Homeowners looking to make changes to their kitchen can also opt for a green kitchen to contribute to a better future and to stop being so taxing on the environment. You may already be on your way; the last dishwasher you bought may have been chosen with the energy and water rating in mind, but there are more ways than this to ensure your kitchen is green, so here are a few tips. If you are planning your eco-friendly kitchen with your qualified designer you need to keep in mind the big picture. It may seem that some products are more expensive. When you are going healthy or choosing earth-friendly products, they usually are. The fact is that these products are more likely to last and what’s more, the kitchen itself is being kind to the planet. Where possible, ask for Australian-made products rather than products manufactured overseas. Most of us recycle. Each home has a separate bin to place outside the yard on bin day (garbage day). It makes sense to have something useful inside the kitchen such as a recycling station. This does not have to be too elaborate, just some individual bins marked for specific contents. On the subject of recycling, another eco-friendly choice for your kitchen is the use of recycled wood. Recycled wood adds a nice warmth to your kitchen and offers a certain sense of rustic style. If you are able, aim for a kitchen that uses more natural light during the day so that you do not require lights all the time. And when choosing lights, choose eco-friendly lighting that does not sap so much electricity. You can choose appliances based on their green ratings. More and more suppliers are getting on board with making eco-friendly options to make it easier for you. With so much awareness about our impact on the environment many of us are making smarter choices that positively affect not only the environment but our pockets, too. The appliances that we use and water we consume are often items that are looked at as well as lighting. When we make more informed decisions and take better actions as consumers, we are doing the right thing for ourselves and the world we live in. If you are about to embark on a new kitchen journey with our team at Craftbuilt Kitchens we would like you to consider the environment in some of your choices. When choosing taps and other water appliances consider their water rating – an AAA rating or similar is the most ideal. Naturally, your budget can affect the taps and other items that you are able to choose, but aim to get the maximum star rating possible. Some taps are fitted with aerators; the difference they can make is amazing. A regular tap may release up to 18 litres a minute whereas an aerator only allows a release of 2 litres a minute. All appliances now sold come with a star rating for their energy efficiency. Energy labels must be present by law and visible, letting you know the environmental impact. They also reveal the approximate cost of running the appliance. If you are selecting a dishwasher for your kitchen it is a good idea to aim for 3.5 stars or higher. To give you an idea, your usage cost is less 30% for each star on the rating. Choosing a dishwasher with an economy cycle and using this the most is also a great choice. Ovens and cooktops don’t come with star rating stickers; however; what you run them on makes a difference. Induction cooktops are the most efficient option with gas following after and electric coming in last and using the most energy. Fridges and freezers also carry the star rating stickers, but also the fridge you choose and how you use it will affect your bill and its eco-friendly capability. Did you know that if you buy that large fridge you have been dreaming of is a waste of money to run if you don’t need that size? It makes sense that if you are using all that power to keep the fridge cool but it’s always near empty, it is a waste of energy and money. Alternatively, if you buy a small fridge but it is packed to the brim, it will have to work harder and thus cost you more to run. The trick is to buy a fridge that is perfectly sized for your needs and the number of people in the household. Appropriate kitchen lighting is important. Dull lighting in work areas where you prepare food is just not suitable. Wanting an energy-efficient kitchen doesn’t mean you have to compromise on the quality of your lighting. You can make use of natural light from windows or skylights for during the day and LED lighting or energy efficient globes for night time. Using gas rather than electricity is a lot more energy efficient and is also cheaper for you. You still see rating labels on gas appliances but it is measured in megajoules. Another bonus of gas is that it is easier to cook with. At Craftbuilt Kitchens we fully support the decision of our clients to go energy efficient and will help with information and decisions in any way we can. If you have any questions regarding our products, the production of these and the appliances we recommend, our showroom consultants and designers are here to help. We can help you build a new kitchen that is energy efficient and amazing regarding food preparation. Craftbuilt Kitchens can help fulfill your dream kitchen and make it eco-friendly too! Call 07 3341 9166 or visit our showroom for more great advice on your new amazing kitchen. When newcomers to Queensland are asked what they like most about living here, the universal answer is the climate. We enjoy mild winters followed by long summers, plenty of sunshine and intermittent rain. Unfortunately, this climate is also the perfect breeding ground for household pests. With no harsh winter to control their numbers, it can be a year-round battle to keep these nasties under control. However, cleanliness and regular action will keep them out of your homes and especially out of your cabinets. Even the beautiful, new cabinets made and installed by Craftbuilt Kitchens need regular attention to keep them pest free. Food hygiene is vitally important so a great place to start is the pantry. 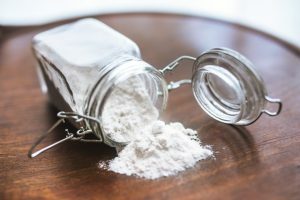 Pests such as flour and meal moths and tiny beetles arrive as eggs in packaged goods, then burrow into soft packeted foods like flour or grains. Working one shelf at a time, empty the pantry and check for powder on the shelves or wriggling or web-like larvae inside packaging. Throw out any contents that are already infested. These types of pests don’t carry disease, but you probably will not want to use anything they have crawled around in. Clean storage containers and shelves with warm water to dislodge any pupae or eggs that have fallen into tiny cracks, then seal the remaining items in plastic containers. Most people are hesitant to spray insecticide into cabinets where food is kept, and many people prefer not to use it at all. This is good news for cockroaches that are notoriously difficult to eradicate if they get a foothold. 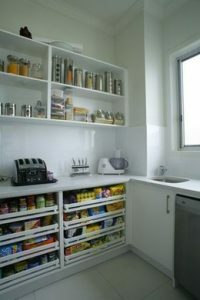 However, it is possible to keep them safely under control and out of your cabinets. Householders who will tolerate some insecticide remedies can use residual sprays in laundry cabinets and follow up with baits placed in the warm, moist areas cockroaches love. Place them under refrigerators, stoves and washing machines, in cabinets under the kitchen and bathroom sinks and replace them every three months. There are also natural remedies that may be effective. None of these will work, however, if the area is not kept clean. Cockroaches feed after dark and just before dawn so any food scraps left on a kitchen bench or in the sink are an open invitation. Keep rubbish bins covered, emptied daily and cleaned regularly. Check cabinets for holes or cracks then seal them to deprive cockroaches of daytime hiding places. Ultimately, it is up to the home owner to keep everything clean and hygienic so there is nowhere for pests to live. 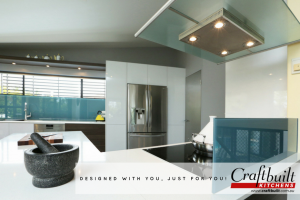 For the best kitchen cabinets maintenance and advice, contact our designers at Craftbuilt Kitchens today!